I couldn’t be more excited to share this recipe with you! I’ve been working on it for weeks, polling friends and readers and it’s finally time to share! This cookie is a little bit dense and chewy in the middle because it’s slightly under baked. It’s a little crispy on the edges and yet it’s soft in the middle. 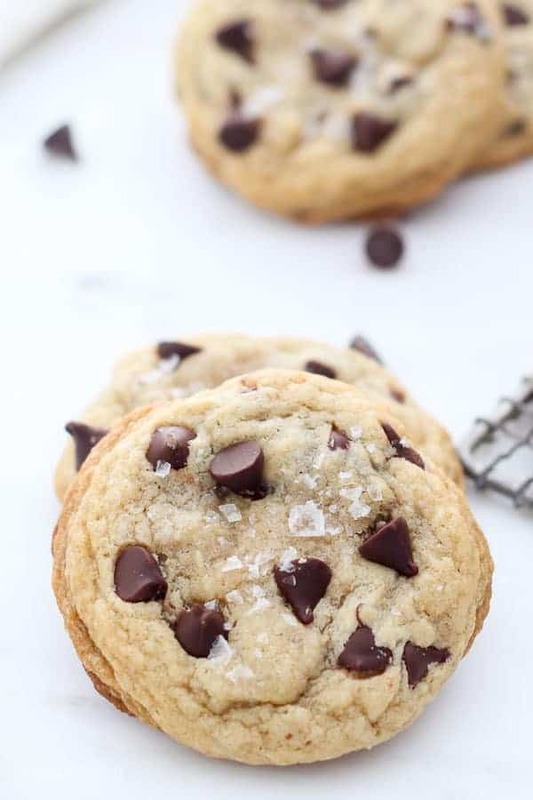 It’s noticeably flavored with brown sugar and vanilla, it’s full of gooey chocolate chips and finished with a touch of flaky sea salt. 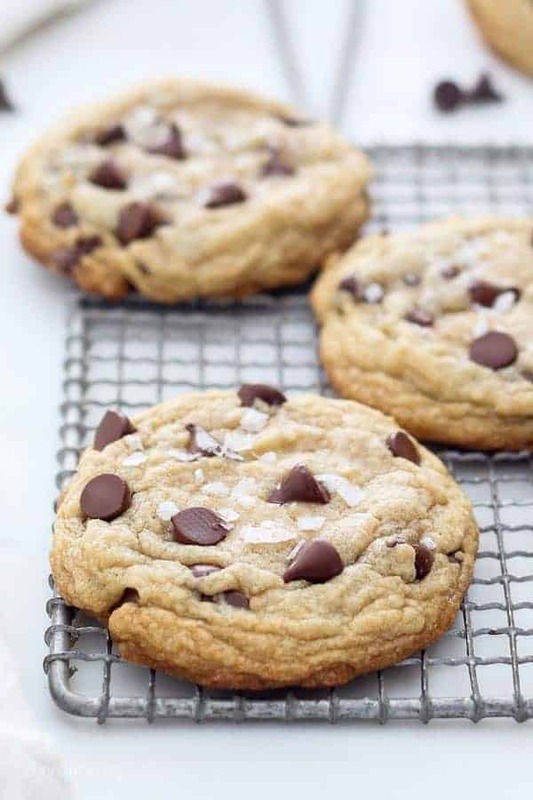 The sea salt is optional, but let’s be real, it makes these cookies even better. 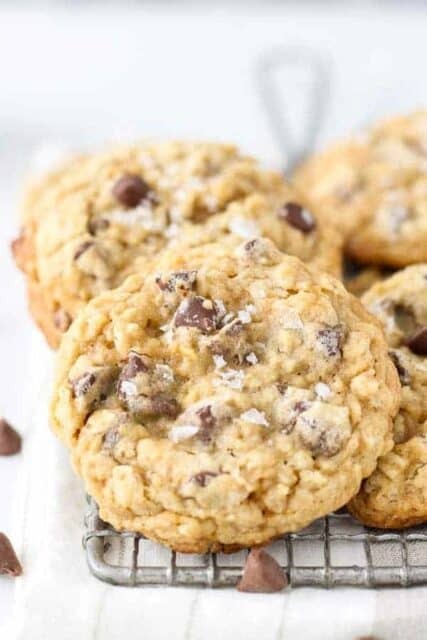 All these attributes for these cookies are similar to the recipe for my Chewy Oatmeal Chocolate Chip Cookies. I actually started with the as a base for test number one. You’ll see this recipe has more brown sugar than white sugar. The brown sugar adds to the chewiness in these cookies, and holds more moisture, which helps keep them soft. The best part is, it’s less than 10 minutes from the time you start, until the time you put them in your preheated oven. It doesn’t get any easier!! The ingredients are simple and are readily available in any baker’s cabinet. 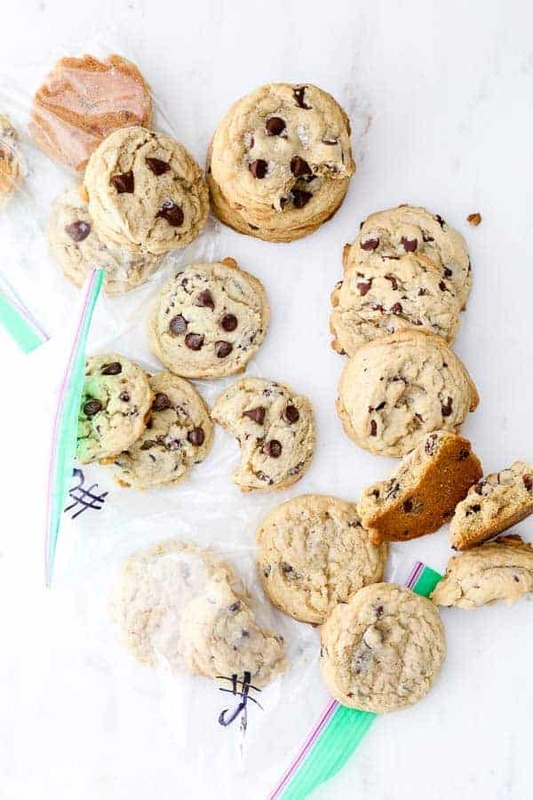 A regular batch makes 10-12 large cookies, and you can easily use your handheld or stand mixer. Since the butter is melted, it’s really easy to mix, and you don’t have to wait for it to soften. When developing this recipe, I made 8 different variations before finding THE ONE. Then, I continued to test it using different methods of preparation. All in all, I made 15 batches of cookies between recipe testing, photoshoots and taste tests. Sadly, for me, this was also around the time that I started my diet again, which made it really hard to resist eating endless cookies (and cookie dough) every night as I was recipe testing. But someone had to do it! What surprised me the most about my recipe for this chocolate chip cookie is that I ended up with a recipe using melted butter. I didn’t grow up making chocolate chip cookies with melted butter, so it never occurred to me to try it. However, I wanted these cookies to be super easy, meaning I didn’t want to require them to be refrigerated before baking, and I fully expected them to spread if they weren’t refrigerated. Much to my delight, my cookies didn’t spread too thin! They got just crispy enough on the edges but stayed nice and soft in the middle. I was hooked. It really changed the overall texture of the cookie and I think it makes the crumb a lot more delicate. They’re less airy because you’re not creaming together butter and sugar, which incorporates air. As I tested different recipes, I asked my friends and coworkers to be taste testers, and I surveyed them to make sure that I was on the right track. Do you know how many people mentioned they prefer evenly distributed chocolate chips? What I learned was fascinating and just how vast everyone’s idea of the perfect chocolate chip cookie could be. Actually, the idea to try a cookie with melted butter came from one of my coworkers that loves to bake. That same person also told me that a perfect chocolate chip cookie should leave you wanting more, like you just ate 3 and you can’t stop yourself. That’s exactly what these cookies are for me and that became the benchmark for my recipe testing. 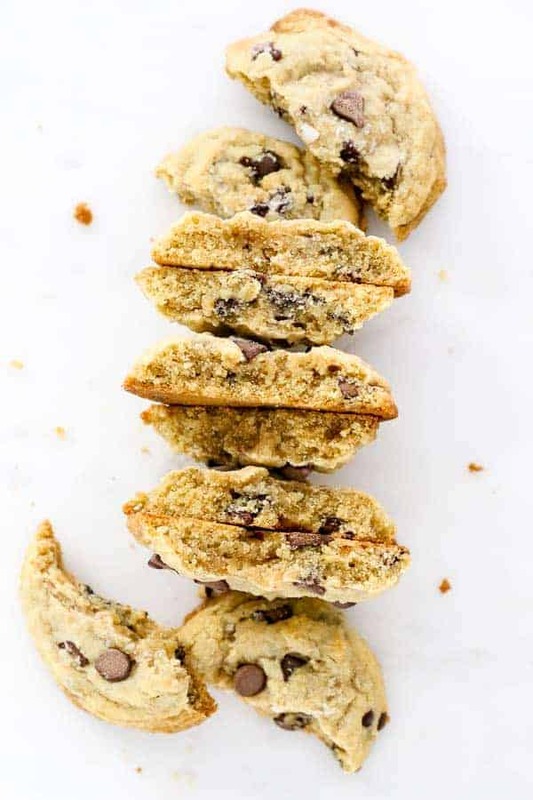 There’s a difference between a good chocolate chip cookie and one that you can’t get enough of. Let’s face it, there are thousands of recipes out there for you to try. Some are better than others, I get it. I found these Chocolate Chip Cookies are best when eaten 30-60 minutes out of the oven after they’ve had time to set but they’re still warm and the chocolate chips are still melty and gooey. Since they’re slightly under baked, you need to allow time for them to set. Even if you’re enjoying these a few days later you can pop them in the microwave for 10-12 seconds and it’s exactly the same. Or you can eat them straight from the bag and they’re still soft and chewy! 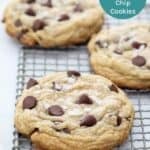 So, I invite you to try my chewy chocolate chip cookie recipe, knowing that my idea of a perfect cookie might be different than yours. But that’s what’s fun about it. This is an opportunity to try different recipes until you find your favorite. I have lots of information to share with you about these cookies, so keep reading, or skip right to the recipe. Melt the butter in a microwave-safe bowl for 30-45 seconds. Combine the melted butter with the brown and granulated sugar. Beat until well combined. In a separate bowl, combine the flour, salt and baking soda. Slowly add the dry ingredients into the dough, mixing on low speed until dough starts to form. Before the dough thickens, add the chocolate chips. Beat until incorporated. Line a baking sheet with parchment paper or use a silicone baking sheet. 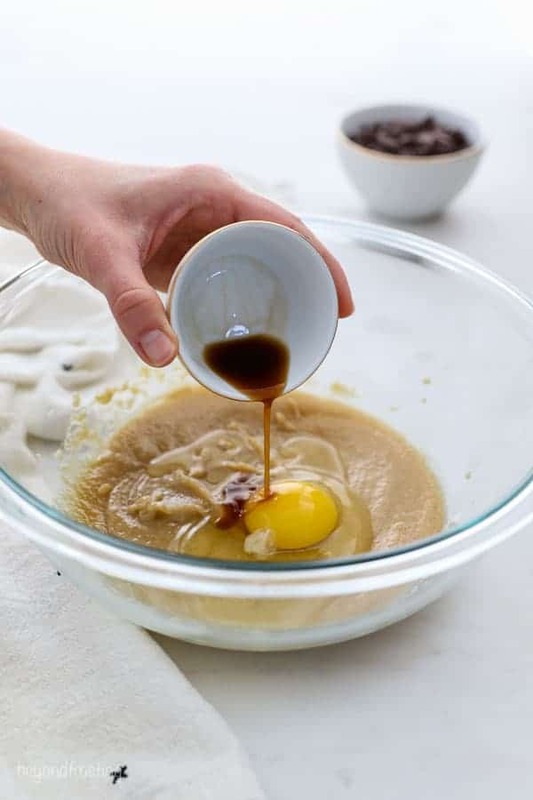 Scoop the dough using a large cookie scoop and place on baking sheet, 2 inches apart. Sprinkle with flaky sea salt. Bake for 9-11 minutes. The edges of the cookies will be crisp and the center of the cookies should be slightly under baked but not too gooey. Cool for 30 minutes. 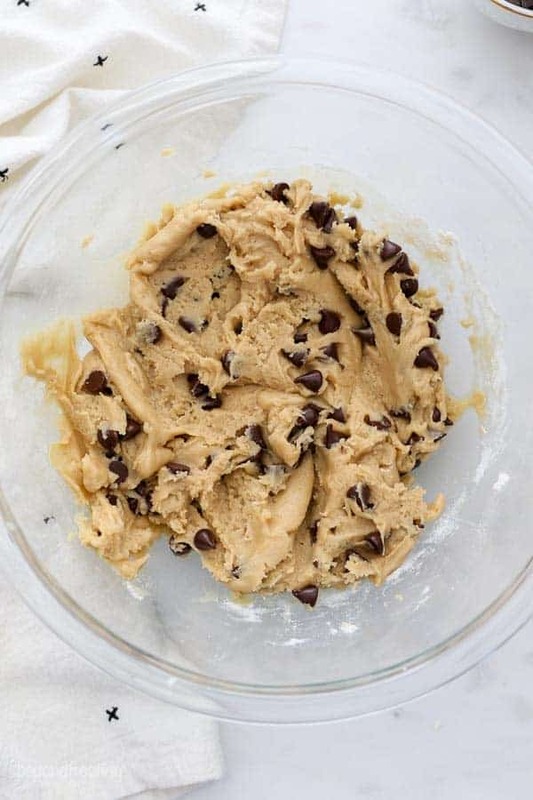 Can I freeze this cookie dough? Can I refrigerate this cookie dough? I mentioned before once I perfected the recipe, I did some additional testing. I wanted to see what would happen if the dough had been frozen or refrigerated prior to baking. My recommendation is to directly freeze the cookie dough if you’re looking to prepare it ahead of time. I found that once the dough was in the refrigerator, it created a very rough exterior and I did not prefer them at all. Be sure to pre-scoop your dough before freezing. I did a time test removing the cookies from the fridge after varying amounts of time and then allowing them to rest at room temperate for 15 minutes prior to baking. I started with dough that had been refrigerated for 25 minutes and then went in 30 minutes increments after that. Regardless of the time spent in the refrigerator, I was not happy with the results. At the same time, I took the cookie dough out of the freezer, and allowed them to sit at room temperature before baking. 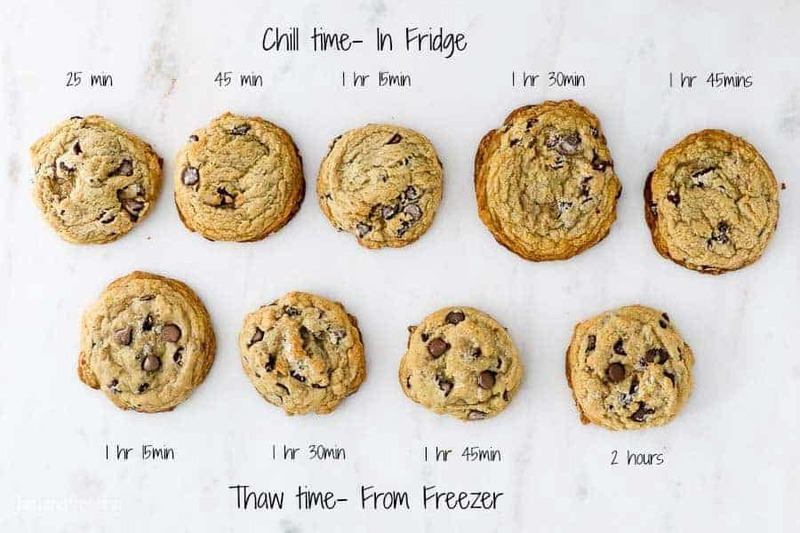 At a minimum, you need 1 hour and 15 minutes to thaw the dough. While this was my preferred time, you can see from the photo that it doesn’t do any harm if it sits out for longer. Can I freeze these cookies once they’re baked? Yes! Absolutely. I definitely ate these straight from the freezer. I typically microwave them for 10-12 seconds and it takes even less time for me to eat them. There are a few factors that can cause your cookies to burn on the bottom. Be sure to bake your cookies on the middle rack of your oven. I bake only one tray at a time, but if you need to bake more than one, switch the baking sheets from one rack to the other halfway through baking. 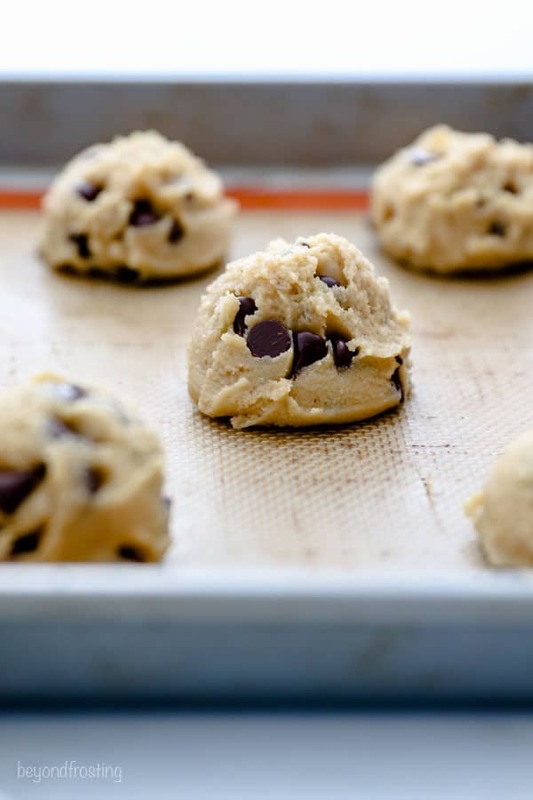 This will help you evenly bake your cookies. True oven temperature can also be a factor. I use an oven thermometer to keep an eye on my interior oven temperature. 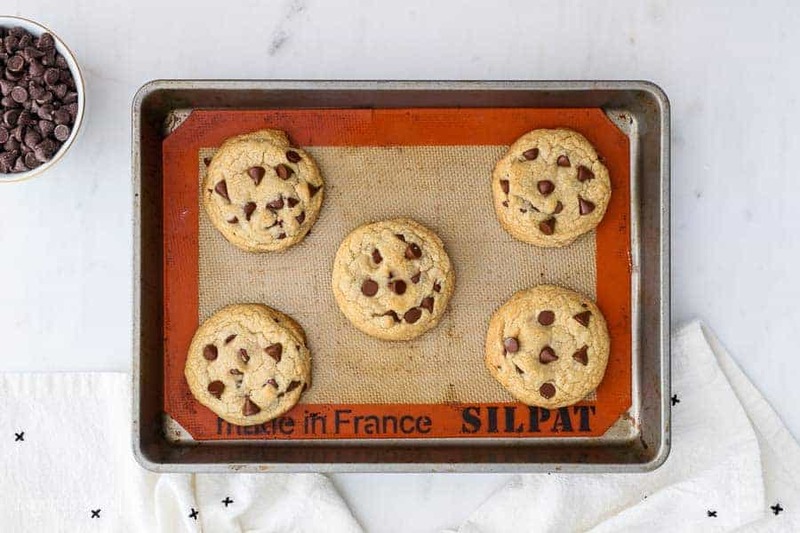 A silicone baking mat can also help prevent the bottom of your cookies from burning. If you don’t have one, at least use a piece of parchment paper. Very dark baking sheets will make the bottom of your cookies darker. My favorite cookie baking sheets are from Calphalon. 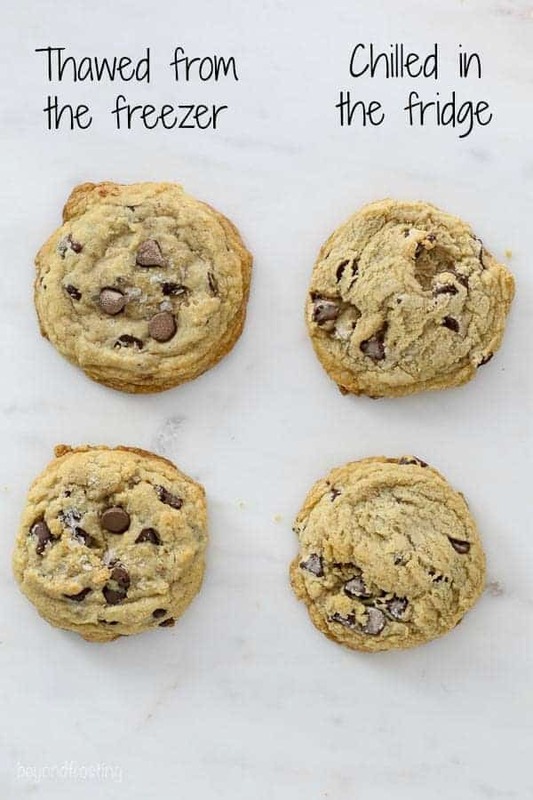 What types of chocolate chips are best for chocolate chip cookies? It’s really up to you. I think it’s important to use a high-quality chocolate chip. My husband prefers Ghirardelli semi-sweet and I also like Guittard. But you can definitely use milk or dark chocolate chips, chocolate chunks or chopped chocolate bars. 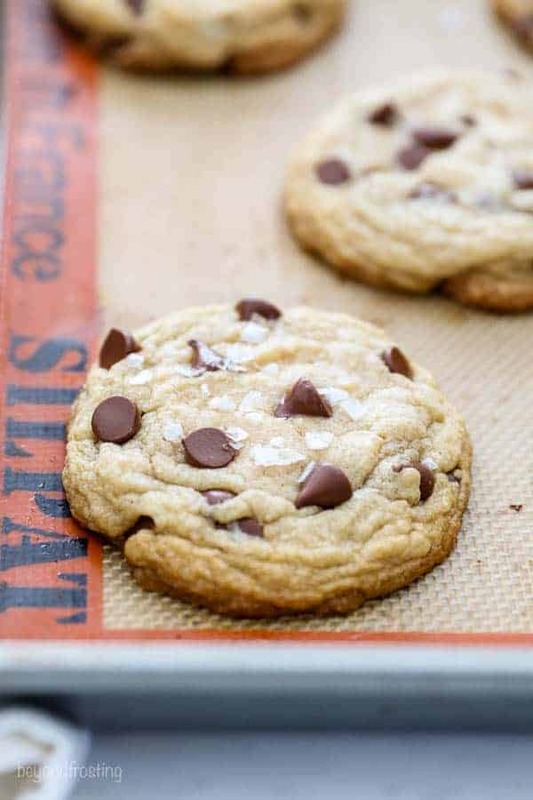 Can I make these cookies with gluten-free flour? I am happy to say YES! I tested this recipe with an all-purpose gluten free flour (1:1 flour) and these cookies still baked up perfectly! I asked a few of my gluten-free coworkers to give me feedback and they loved them! They mentioned that the cookies were particularly soft, which is difficult to achieve with gluten-free baking. 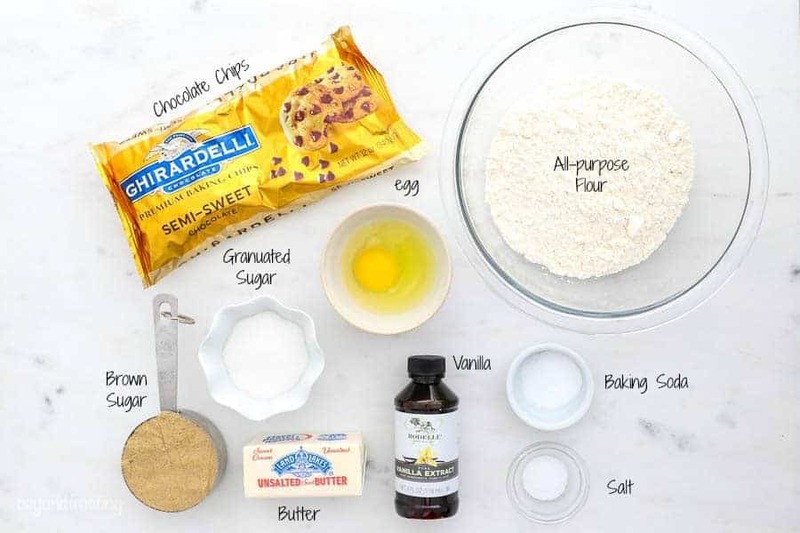 As I don’t do a lot of gluten-free baking, I can’t say for certain what would happen if you tried these with alternative flours such as almond or coconut flour. Note that my AP gluten-free flour also included xanthan gum. 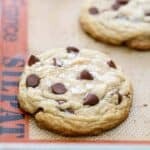 How do you make such round chocolate chip cookies? Right when the cookies come out of the oven, use an offset spatula, knife or spoon and gently press the edges of the cookies in towards the center of the cookie. You have to do this right away! 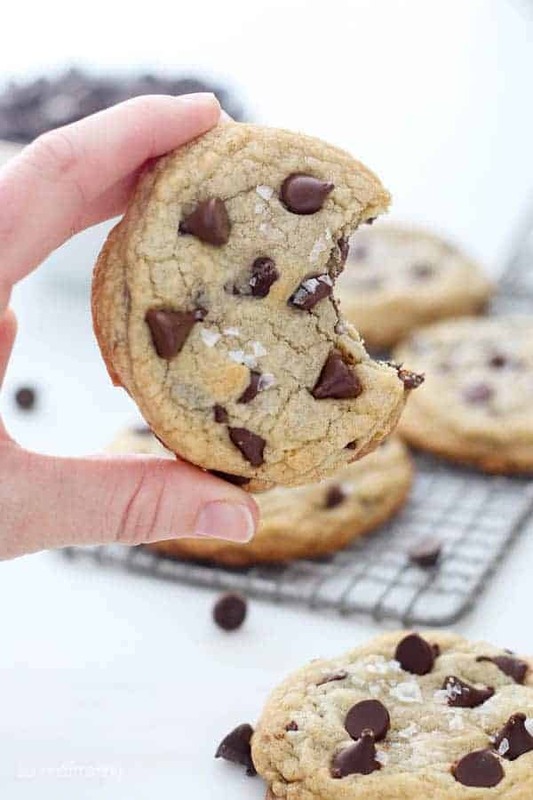 I also throw a couple chocolate chips on top of the cookie before they go into the oven, or press them in right when the cookies come out of the oven, so you get those nice, visible chocolate chips on top! 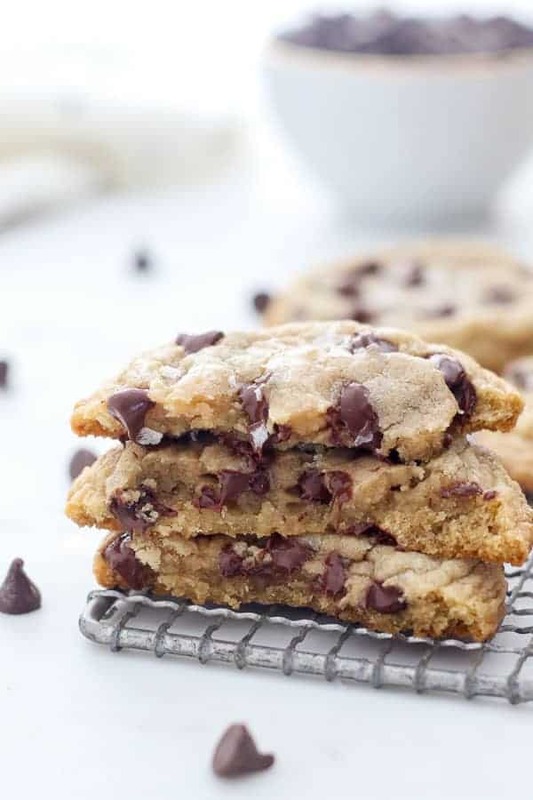 I hope you enjoy my easy, soft and chewy chocolate chip cookies! 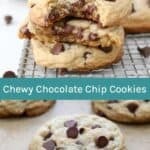 These are the EASIEST and BEST Chewy Chocolate Chips Cookies. Only 10 minutes to prepare! These cookies is are little bit dense and chewy in the middle. It’s crispy on the edges and soft. 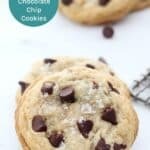 It’s flavored with brown sugar and vanilla, it’s full of gooey chocolate chips and finished with a touch of flaky sea salt. Preheat the oven to 350° F. Melt the butter in a microwave-safe bowl for 30-45 seconds. Combine the melted butter with the brown and granulated sugar. Beat on medium speed until well combined, 2-3 minutes. Next add the egg and vanilla extract and continue beating until well incorporated. In a separate bowl, combine the flour, salt and baking soda. Stir to combine and slowly add the dry ingredients into the dough, mixing on low speed until dough starts to form. Bake for 9-11 minutes. The center of the cookies should be slightly under baked but not too gooey. Allow to cool on the baking sheet for 10 minutes before transferring to a wire rack to cool. Looking forward to trying this recipe! Question though – does it matter if you use salted or unsalted butter? Hi Theresa, the recipe itself will work either way. However, if you use salted butter, I would cut the salt in the cookies in half. Then you can add salt on top accordingly. I prefer a salty cookie but I use unsalted butter, so if you’re using salted butter it might be too much for some! Enjoy! These were just what I needed on a Monday afternoon. Soft, chewy and delightful! 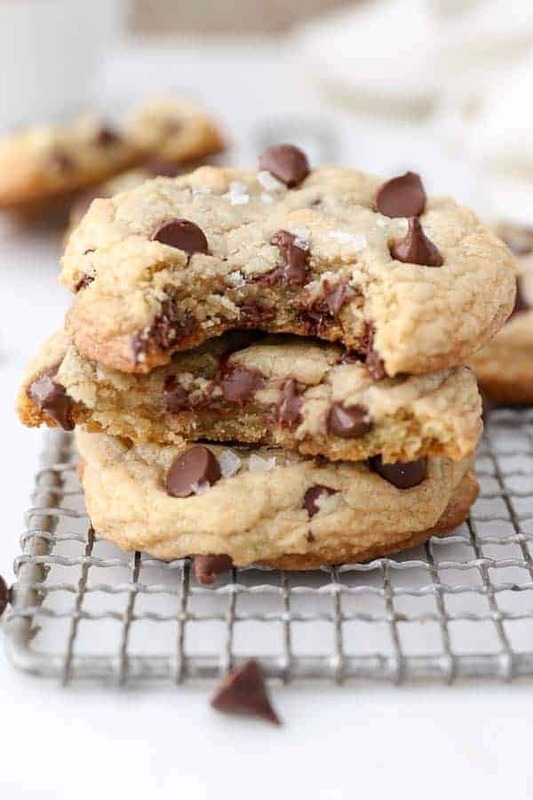 I have had quite the battle finding a recipe for chocolate chip cookies and I’ve FINALLY FOUND IT. 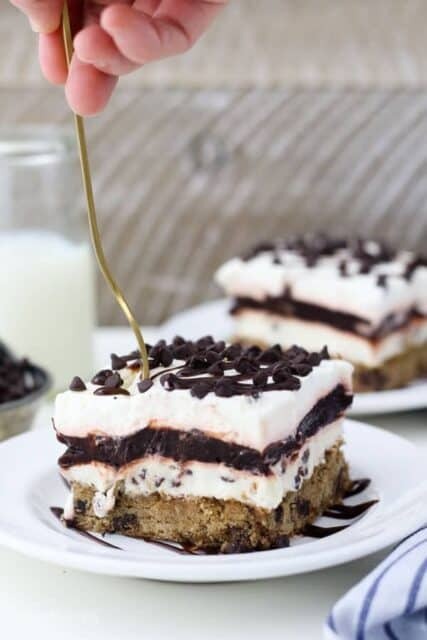 Thanks Beyond Frosting for putting the time and effort to share this perfect recipe with all of us! OMG Ashley, I am SO happy to hear that!! Thank you for trying them! These gotta be the best choc chip cookies! Looking forward to them!